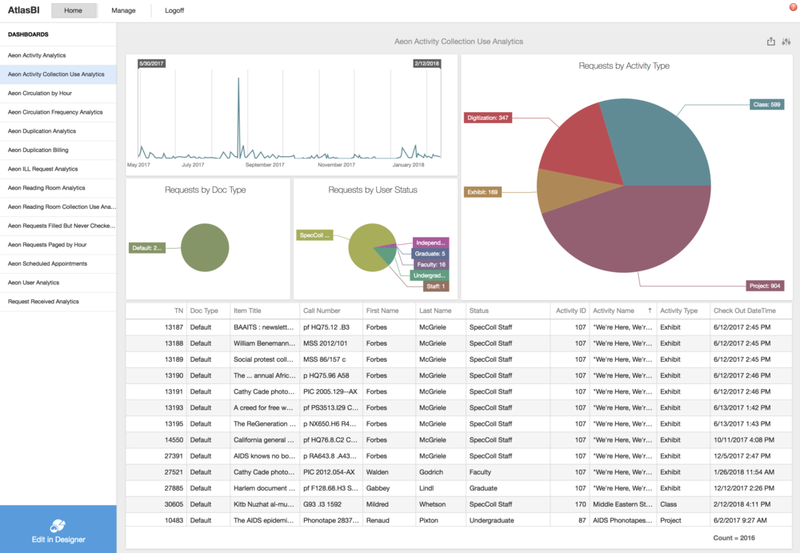 AtlasBI — Atlas Systems, Inc.
A variety of reports are currently available and new reports can be created and edited directly from the web. These dynamic reports allow you to filter and review your data in real-time, giving you flexibility not seen in traditional reporting solutions. 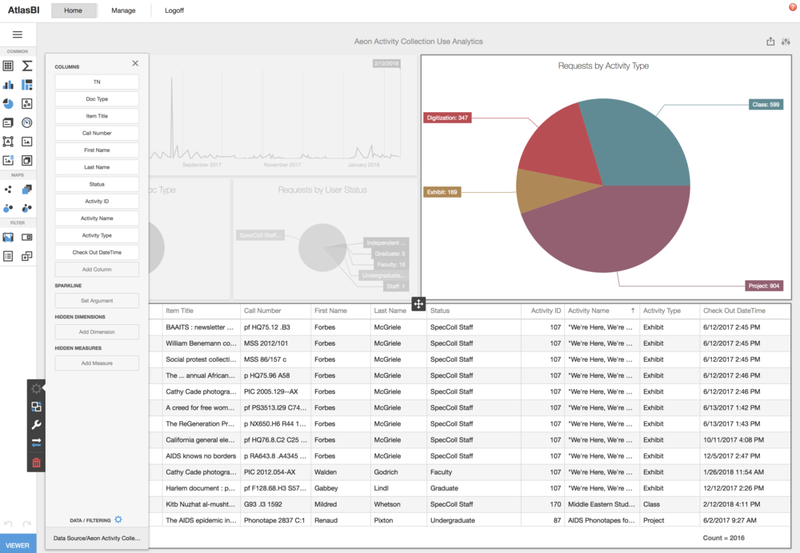 Ease of use: Simply log in and start visualizing your data in new ways. Ease of filtering: Results are linked across the report, allowing you to filter each result to get to the data that matters most to you. Real-time access: The system queries the database in real-time, giving you up to the minute results. Exporting: Export entire dashboards or sections of dashboards into PDF, Image, or Excel formats. Use PDF or Image to include sections of the dashboard into other reports. In Excel, each section of the dashboard is exported to a separate worksheet, allowing you to massage the data even further. Built-in Report Editor: Updating reports is as simple as "click and edit". Don't worry about losing an original version: you can always add the default reports back to the system from the Reports Gallery. Best of all, if you currently subscribe to a product from Atlas, AtlasBI is included as part of this subscription going forward! AtlasBI is currently available to all Aeon customers who are hosted by Atlas and may be found at https://YourServerName.bi.atlas-sys.com. For example, a site with Aeon web pages located at https://ABC.hosts.atlas-sys.com would find their AtlasBI reports at https://ABC.bi.atlas-sys.com. To log in, enter the same credentials you use to access the Aeon client. You need Staff and Customization Manager permissions to be the first administrator from your site to log in. For more information or any questions you might have, contact support@atlas-sys.com. We'll be rolling out support for other products and systems soon!